First Suite in E Flat was one of the first original compositions for band. The repertoire at that time consisted of popular pieces and orchestral transcriptions. To distinguish it from a Brass band, the designation Military band was used (i.e., in addition to brass instruments, woodwind and percussion instruments were employed) - what would today be referred to as a Concert or Symphonic Band. Gustav Holst, composer, pianist and trombonist, was born on September 21, 1874 in Cheltenham, England and died on may 25, 1934 in London, England. Although his most famous work is The Planets, Op. 32 (1914-6), Holst composed a wide variety of works: more than 10 operas - 4 published: Savitri (Op. 25, 1908), The Perfect Fool (Op. 39, 1918-22), At The Boar’s Head (Op. 42, 1924) and The Wandering Scholar (Op. 50, 1929-30); several works for chorus and orchestra, including Hymn To Jesus (Op. 37, 1917) and Choral Symphony (Op. 41, 1923-4); many orchestral works, including A Somerset Rhapsody (Op. 21, No. 2, 1906-7), St. Paul’s Suite (Op. 29, No. 2, 1912-3), Egdon Heath (Op. 47, 1927), Double Violin Concerto (Op. 49, 1929) and Brook Green Suite (1933); a very large number of choral works; and, of course, works for band, including 1st Suite for Military Band (Op. 28, No. 1, 1909), 2nd Suite for Military Band (Op. 28, No. 2, 1911), A Mooreside Suite (for brass band, 1928) and Hammersmith (Op. 52, for military band, 1930). In this arrangement as a Sonata for Flute and Piano, as much as possible of the Solo Flute band part has been retained and the part has been marked to indicate the original source (Woodwinds, Brass, etc.). 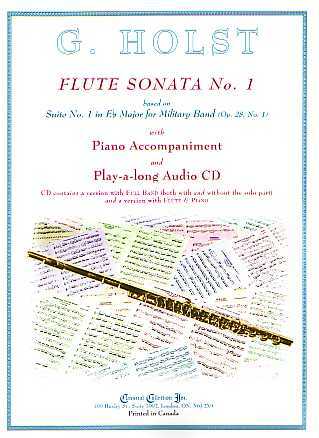 This makes the Sonata ideal for any flutist who is studying or performing the First Suite, to better play, understand and, in general, enjoy the wonderful music of the outstanding piece!